Paraparaumu's only 4 Star Qualmark rated motel built in December 2001. All luxury studios and executive suites feature spa baths and high-speed Internet access. Very quiet and peaceful, suites surround a large fenced green space with mature trees and courtyard. Situated within a 5 km radius of major attractions including Southwards Car Museum, Paraparaumu Links Golf Course, Lindale Tourist Centre and Farm, departure point for Kapiti Island Bird Sanctuary and safe swimming beaches. 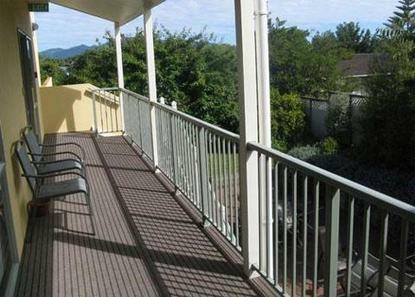 Two minute walk to shopping centre and railway station. Scenic train trip into Wellington with glorious harbor views.